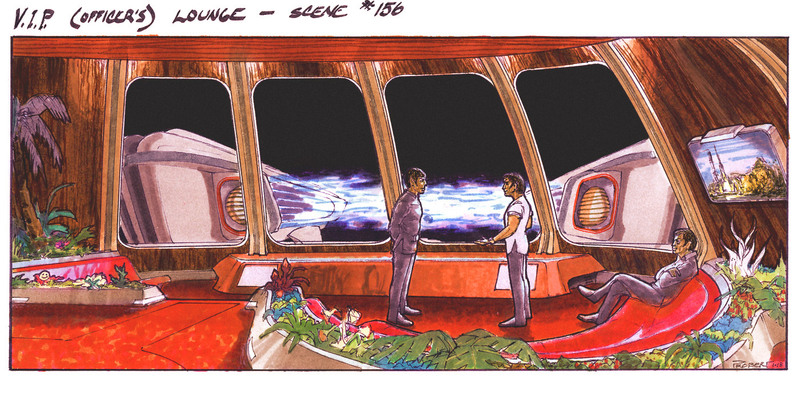 The production drawing titled “Locating the VIP lounge” was done by Mr. Probert when they were working out where to situate the aforementioned VIP/Officer’s Lounge within Enterprise. It is undated, but we know from the details the lounge design shown in this cut-away that it was done prior to the other Probert production sketch I still have to scan, which is dated “2-18-79”. We know this came before the other one because of two key things in the drawing. VIP/Officer’s lounge by Andrew Probert. One, the lounge design itself was an earlier concept with slightly different seating components. Mainly the lower seating area in this earlier design was a round sofa as opposed to the later design which was realized for the FX shot looking out of the aft windows for the Vulcan Shuttle arrival in the film. In the image on the right is a concept sketch by Probert of this earlier design. Two, this drawing shows a slightly different shuttle docking port area, with the aft bulkhead angled outward at the base, and the docking port area “cut-into” this angled back structure. 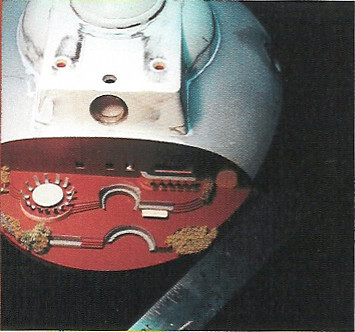 This was altered in later designs with the aft bulkhead being completely vertical and not set-back or “cut-in” for the docking port. For these reasons it is reasonable to place the timeframe of this drawing as after January 10, 1979, when Probert drew the concept sketch of the Bridge/2-3 deck superstructure exterior which was mentioned in the previous post. But before February 28, 1979. Now you may wonder why I am now saying “2-3 deck” instead of the “B/C deck” name which I have been up till now? Well a fellow ST:TMP fan, Joshua Tucker, commented when I posted my previous blog post in the Star Trek the Motion Picture Appreciation Society Facebook page—yes there is such a thing, and yes I am a member of it—pointed out that within ST:TMP (and even in the original television series) they almost always used a numeric designation for the decks, and not letters. I had fallen into the usage of the term “B/C deck” because it is commonly used in various modeling boards, and in some of the fan-created technical manuals and blueprints. But Joshua brought up a good point in how I should probably refer to it by deck number in these documents I am creating. So numbered decks it is going forward. working out the location of the VIP lounge. It is a layered PDF meaning there are different image layers that can be turned on or off. For this particular drawing, I have two different versions drawn within the PDF. The first is done to the size of the drawing itself, which is not exactly to the 1:120 scale of the filming miniature, though it is quite close. Using the 12′ dimension stated vertical size of the aft lounge windows shown in the drawing itself and measuring that precisely, we can mathematically work out this is at approximately a 1:118.0375 scale. Where 30.987 mm = 10′ feet. So there are a set of layers with the artwork, dimensions, constructions lines, etc. all at the actual scale of the drawing. They are listed with a label suffix saying “1:118 scale”. 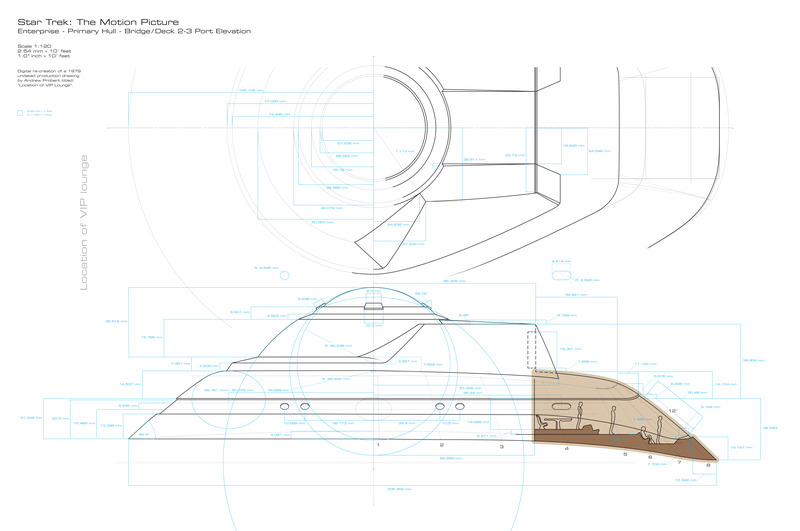 I have also scaled that drawing by 98.36% to make it precisely the 1:120 scale of the filming model. So there are a set of layers with the artwork, dimensions, constructions lines, etc. all at that scale and are listed with the label “1:120 scale”. Anyway, I hope to tackle the remaining Probert production sketch I recently acquired next, then back to fishing up the “film accurate” set of drawings for the Bridge/2-3 Deck. Then bring all that in my 3D modeling software to work out ceiling lines and clearances. This’ll then allow me to finally finish up the VIP/Officer’s Lounge blueprints. At that point, I will post all that along with the high-resolution scans of the two Ekker production blueprints of the Lounge miniature/set piece I picked up at auction earlier this past Spring. This entry was posted in Project Enterprise, Projects and tagged 2-3 Deck, Andrew Probert, B/C deck, blueprints, bridge, concept art, Leslie Ekker, Officer's Lounge, production sketch, storyboard. Bookmark the permalink. I love what you have been doing with all of this. And thank you for sharing it all with the rest of us. One other thing to think about is the fact that per these and some other drawings Andy Probert made, his designs of the superstructure was only meant to house one deck not two, so it should be just Deck 2. I’m not 100% sure which other Probert drawings you are referring to which shows that the superstructure was only intended to house a single deck. I say this because even in this and the Ekker production miniature drawings based on Probert’s design that there are steps down on the port-side (right side looking aft) of the lounge which drop the entire outer corridor area on the port-side, over a full meter below the upper lounge seating area (even lower than the sunken seating area of by the large aft bay windows). We know from some contextual clues, specifically the David Kimble cutaway poster which was done at the time of TMP production and who was bought in and worked with Astra Images that the deck where Kirk’s quarters is located is Deck 5 and in the poster artwork, you have to have two decks in the superstructure section (with about half a deck extending below the superstructure main saucer hull seam) to match that as far as vertical deck placement. Not saying you are wrong, but would love to see the drawings you are talking about as reference. This one shows the earlier version of the ship prior to the self-illuminating modifications. It shows one deck for the structure under the bridge. In addition, it also shows how Andy intended the rest of the saucer decks to be spaced. 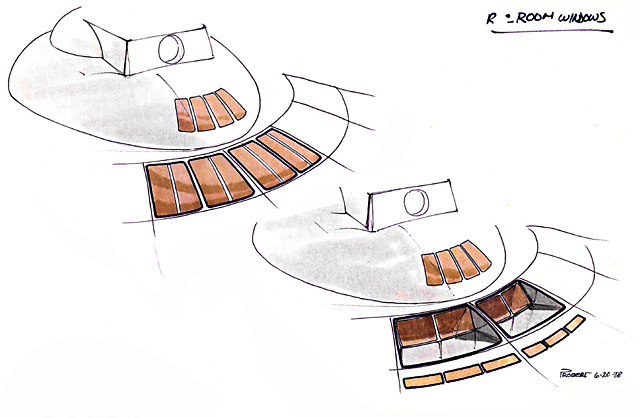 This drawing shows a comparison between the original and final design of the bridge, deck 2, and lower sensor array. You can see how much lower the final deck 2 is compared to the original. I do agree with all of your thoughts about the deck numbering and where the quarters are supposed to be. For me, I have to chalk that, along with other issues, up to movie production inconsistencies. I’ve always focused more on what Andy Probert intended for the ship than what was shown on screen. He seemed to have a better grasp as far as how much space and volume the “real” ship had and what had to be done for things to fit (his version of the rec deck as an example). I know that doesn’t help you with what you’re trying to accomplish (and I truly love what you are doing). Anyway, I hope the drawings help you in some way and I look forward to more of what you have planned to show us. While it does seem to show a “floor” or deck line for the aft seating area of the Officer’s Lounge at the back of the bridge superstructure, I am not 100% sure we can extrapolate from that, the rest of that “deck” would follow that line going forward as sketched. I say this because it would make the port/starboard docking port deck lines not align at all. There would be an over four foot misalignment between the deck of any shuttle/travel pod docked, to the interior deck line. It may indeed be what Probert might have intended, but that would foul up the aforementioned docking port alignment and windows and open up a different can of worms. 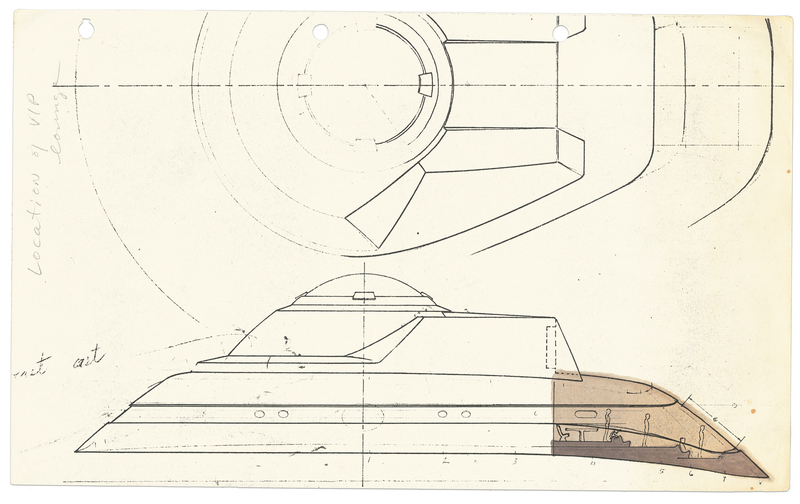 So it is indeed hard at times to work out—even within the Probert/Taylor original design drawings and sketches—exactly what the internal deck schema was supposed to be for the saucer section. We have a little more clarity in the secondary hull because of Probert’s sketch which shows the basic deck level and area configuration for the cargo area, the shuttle elevators and the landing deck/work bee storage levels. And I certainly agree that Probert and Taylor and the other designers at Astra/Magicam seemed to be a little more mindful than Hal Michaelson was about interior and exterior spaces and at least made an attempt to make it all fit (in general). Another thing I find interesting in the cutaway profile is that it seems Probert was willing to suggest differing deck to ceiling heights for different decks. If you notice both the upper level and lower levels in the proposed two-level Rec. Room, have a much taller deck to ceiling height than the two main saucer decks. They also seem taller in the lower saucer “bulge” as well and seem to be about the same as the “above the rim” ones. But yes, the bridge dome and superstructure redesign only compounded some already challenging “fit” issues vertically within the space. I have not yet done the deep dive on the bridge itself, but of course that will be part and parcel to working out the superstructure as a whole, ad how it connects and “fits” to the saucer, and so on. It may need to push the bridge deck lines (with the sunken “pit” area with the center helm/nav consoles and captains chair dais) upward within the bridge dome and “fudge” the deck below its ceiling level accordingly. I would add that while the area “behind” the bridge where the aft docking port ended up is operated by the turbo lifts acting as a sort of rotating access chamber to said docking port, it would mean that “shifting upward” would need to occur to get the “upper” bridge deck ring (where the sounding stations like science, etc. are) to be at least close to the aft docking port deck level. Which of course at this stage, may not as yet and issue since there were the two port/starboard docking ports on the deck below the bridge and may not have yet been envisioned and/or moved to the aft face of the bridge level structure, though it does appear in the Probert exterior 3/4 angle sketches above. It is a strange (and at times seemingly impossible) balancing act to squeeze it all in. In the end it may not be truly recognizable as “shown” on screen (we know the final rec. room as filmed would not fit) so some “fudging” and aesthetic/design rationales may need to be chosen to try and find a happy medium between intention, and actually built and filmed. BTW, did you upload those and if so, where did those images come from? Always good to know the provenance of any of the production sketches and drawings to help figure out where in the production they fit, etc. and give appropriate credit to when we can. I came across an image a million years ago which shows a beautifully detailed lounge/conference room that was built in the original version of the superstructure for the filming miniature. I’ve searched but never found any others or another version of this image in a better resolution. The lounge had three different levels: the main deck with a starboard side door which seems to be at the same level of the deprecated docking ports, a recessed level with inset seating for the big bay windows, and an elevated level with a conference table for 15, more inset seating, and a full bar. That would have been quite a set had it been built full scale for the series/film. The third image shows the drawing that was made for it. I really wish the current lounge drawing wasn’t covering part of it. All the images that I have I saved from either internet searches or from the many, many message boards. Unfortunately, I did not keep track of where they came from. I wish I could credit their origin but I don’t have the information. Thanks John for that image. Yes, you are correct Gus, that image seems to be flipped. And thanks for the higher-resolution (and “un-flipped” version of it) as well as the stand-alone image of the model insert with the photo backdrop. It is also interesting in that “backdrop” image you can see the original red pin striping around the side bustard grill intakes on the nacelles. I agree that it would be great if the image of a copy the Probert sketch of the “newer” lounge, which I have in my possession, was not blocking the “older” lounge design drawing. I wonder who picked that one up from the Christie’s auction? I would add, those conference table seats are super skinny. Like almost not even being in proper scale. Given that we know the diameter of the docking port is 7′ 6″, those seats don’t seem to be even a foot wide. Even the scale figure basically shows those seats at the round table would be like sitting on a 4″ x 4″ beam.